I find Mini Coopers really cute so I had to stop and make a snap when I spotted this along the way. If you'd like to see more yellow entries, please click on the button above. Happy MYM to all! That car IS adorable, and I especially love the yellow color. that is really a cute Yellow Car! Hello! Got something for you HERE! perfect for the mellow- yellow theme. 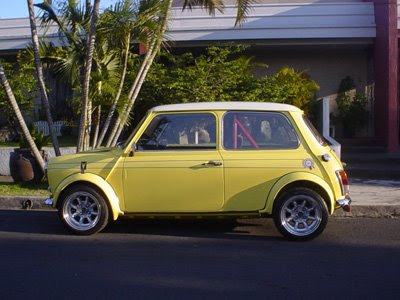 Mini Coopers are sooooo cute and I read they are really good on gas. those are really nice cars and one fine one you've found. great capture for MYM! I think they're cute too! Those and the little VW bugs with the flower vases on the dash boards! So cute! They are cute! And even cuter when they're yellow! those are really cute cars! perfectly maintained pa! The color is just perfect! I think too small for me. Hehe, where should we put the "shopping stash. Nice color. perfect for the theme.